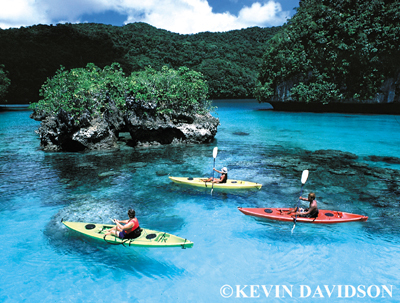 Home to more than 1,500 species of fish and 700 species of coral, Palau has consistently been ranked among the best in categories such as “best destination by region”, “best fish life”, “healthiest reefs”, “best big animal diving”, “best wall diving” and “best wreck diving” by the readers of Rodale’s Scuba Diving magazine. 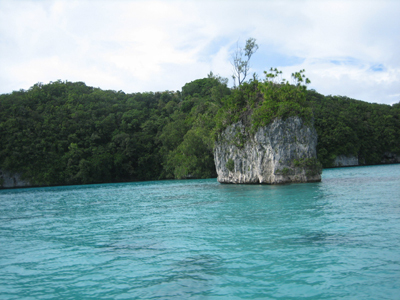 Famous not only for its diving, Palau is also known world wide for it’s mushroom shaped rock islands which dot the sea, creating color combinations of emerald, turquoise and aqua where jungle meets ocean. Visitors to Palau fly in through Palau International airport which services direct flights from Guam, Taipei, and Manila. The main commercial center of Palau is Koror. The airport itself is not located on Koror but on Babeldaob island, which is about a 15 minute drive to Koror. Palau is 17 hours ahead of Los Angeles and 14 hours ahead of New York. Sam’s Tours also features the Eclipse, an ocean sailing yacht which offers the benefits of a liveaboard without the large number of people. It is best for couples, families or small groups of friends. Sam’s original land tour service will take you to sites seldom seen by others. 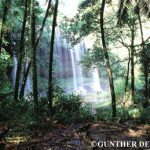 Tours are custom-coordinated according to your preference and can include majestic waterfalls, the legendary Yap stone money, World War II historic sights, spectacular marine lakes and the German Lighthouse, which offers an amazing view of Palau’s eastern lagoon. Wherever your interests lie, you can be sure that Sam’s Tours will provide you with the experience of a lifetime. Fish ‘n Fins is located in Koror, approximately 20 minutes from the airport. 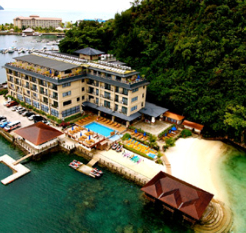 It is right next to the Palau Marina Hotel and a short 5 minute walk from town. “Normal” fare is a two tank dive day which includes lunch and drinks. The boats leave the dock about 8:30 am and return around 4:00 pm. A third tank is available for the energetic upon request. Night dives can also be arranged. Snorkelers can join the dive groups, as the visibility is 80-100 ft. Depending on the size of the boat, divers are placed in groups of six to eight, based on experience. All six dive boats are equipped with cushioned seating, protective overhead covering, and dry storage compartments. 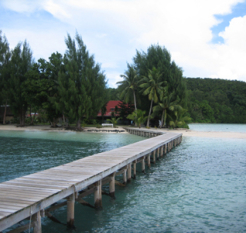 Splash is a 5 Star PADI dive center located at the luxurious Palau Pacific Resort. Offering guided diving and snorkeling trips, equipment sales, rental & repair, diving instruction & certifications and more, Splash is a convenient on-site option for resort guests. Facilities include a private pier, pro shop, rinsing area, and guest storage. Hobie cat & kayak rentals are also available. Photo Palau is located close by and carries a complete line of Nikonos underwater cameras and strobes for both video and still photography. Daily processing for E-6 and print film is available along with photography supplies, accessories, video services and photography courses. Large, well equipped, and fully air-conditioned cruiser. Well trained staff and comfortable accommodations. Ocean Hunter I – 60 ft. motorsailer designed for 6 divers. Comfortable, safe, and user friendly. Ocean Hunter III – newest addition to the Ocean Hunter fleet. 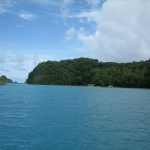 This is considered to be Palau’s best dive site. It is an exhilarating drift dive along a wall of soft corals hosting a variety of reef fish. As you come up on the reef, you’ll take out your reef hook and hook on to a rock to enjoy the action. Grey reef sharks, black and white tip sharks, tiger sharks, turtles, schools of barracuda, yellow fin and dog tooth tuna, trevally, groupers, schools of batfish, eagle rays, and napolean wrasse…it’ll be a challenge to take it all in. 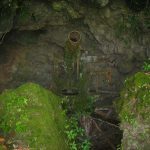 Four vertical shafts open from the top of the reef into a large cavern with an exit on the outer reef wall. Wire and black corals surround nudibranchs, disco clams, cleaner shrimp, and leafy scorpionfish, while white tip and leopard sharks sleep on the sandy bottom. During the outgoing tide, you can continue this dive to Blue Corner. This wall drift dive is very similar to Blue Corner except that instead of one corner, you will find 3 corners, each having its own variety of fish and sharks. You will see grey reef sharks, white tips, napoleon wrasse, eagle rays, barracudas, and hawksbill and green turtles. Currents can be strong and can change between dives. It is important to pay attention to your dive master and guide. 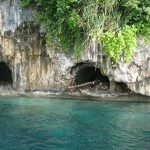 This was built by the Germans during the 1900’s to serve as a passageway for vessels coming from Peleliu and Angaur to Koror. Now it serves as a passageway for dive boats to the dive sites. 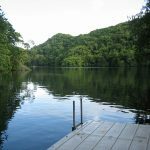 The inside of German Channel is too shallow to dive, so your dive will take place just outside, where it slopes to a sandy bottom. A manta cleaning station is the main focus here. You will also see sting rays, spotted eagle rays, turtles, giant clams, cuttlefish, barracuda, garden eels, and white tip sharks. The exceptionally fast current here provides excitement, while the colorful soft corals and gorgonian fans make it a photographer’s favorite. Visibility is 100 ft despite the current. Along the wall you’ll see anemones with clownfish, emperor angelfish, sweetlips, surgeonfish, eels and turtles. You’ll also spot white tip and black tip sharks, schools of tuna, barracuda, jack, and snapper, rays, giant groupers and napolean wrasse. Triggerfish, anthius, and butterflyfish complete the picture. This is where Nautilus dives take place. The wall features soft corals, table corals, butterflyfish, angelfish (including Watanabe’s angelfish), wrasses, grey reef, white tip, and black tip sharks, batfish, jacks, parrotfish, eagle rays and octopus. This is another great site to see manta rays, especially from January through April. Three cleaning stations have been know to service from 3 to 30 mantas at once. You will also enjoy the sight of rainbow runners, reef sharks, bumphead parrotfish, black snapper, unicornfish, striped skipjacks, fusiliers, crocodile fish, nudibranchs, leafy scorpionfish, and barracuda. 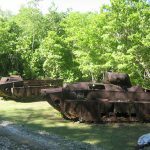 This wreck of a small Japanese supply ship, discovered in 1990, reveals a multitude of WWII artifacts including helmets, gas masks, belts, shoes, beer and sake bottles, machine guns, and ammunition stacks. Staghorn, brain and lettuce coral surround the ship, while shrimp, banded pipefish, lionfish, and a variety of other reef fish dot the landscape. 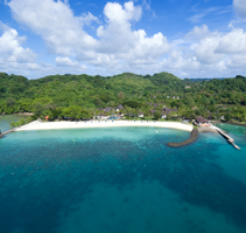 The 5 star Palau Pacific Resort, just ten minutes from the capital of Koror and 25 minutes from the international airport, is nestled on 64 acres of lush tropical gardens and boasts a gorgeous and private white sand beach. The resort features 160 guest rooms including 24 Ocean Front rooms (left), 68 Ocean View rooms, 60 Garden View rooms, 4 Luxury Ocean Front Junior Suites, and 4 Luxury Ocean Front Suites. All offer 1 king or 2 twin beds, private patio or balcony, a/c & ceiling fan, TV, in-room safe, electric kettle, mini bar, bathroom with tub & shower, separate lavatory with TOTO washlet, bathrobes & slippers, hair dryer, bath amenities, turn down service, and room service. 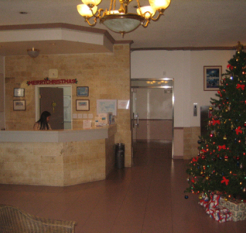 The Luxury Ocean Front Junior Suites (right) feature a large living area with pull out sofa bed and can be connected to the Ocean Front Room next door if additional space is required. The Luxury Ocean Front Suites (below) boast a separate bedroom, large living room, plasma screen TV that can be turned to face either room, specially designed bar complete with amenities, comfortably furnished private patio or balcony, double sinks and a large bathtub. This great new hotel is conveniently located right on the water near Malakal Harbor & Sam’s Tours. Choose from an Ocean View Single Room (upgrade to a 180 degree view), a Mountain or Ocean View Twin Room, an Ocean View Honeymoon Room with a 180 degree view, an Ocean View Sunshine Suite (upgrade to a 180 degree view), a Mountain View Sunshine Suite, or an Ocean View Family Suite. Kick back on your spacious balcony while enjoying the spectacular 180 degree view from your Ocean View Suite. All rooms enjoy clean, modern bathrooms with large showers. Relax at the swimming pool or on the adjacent sun deck. Experience the intimacy of the Carolines Resort. Enjoy your own private bungalow, inspired by Palau’s centuries old architecture, with all the comforts you’ve come to expect. 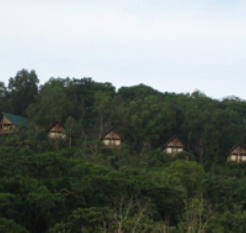 The seven bungalows are situated on a secluded hilltop with an incredible view of the Philippine Sea. Each bungalow features air-conditioning, a private bath, cable TV, refrigerator and mini bar. A variety of breakfast options are offered every day and may be enjoyed from your private balcony. 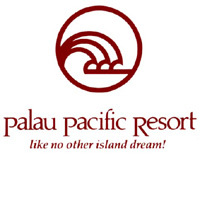 All guests are also granted access to Palau Pacific Resort’s private beach, swimming pool, fitness center and tennis courts. A stunning sunset overlooking Palau’s magnificent Rock Islands awaits you from your balcony. Pacific Treasures, a unique on-site boutique, offers a vast array of souvenirs to take home, as well as beverages and tasty snacks to enjoy. Be sure to try the homemade rum cake! 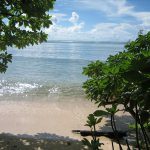 If you prefer to end your day of diving with a relaxing, tranquil, and private evening, the Carolines Resort is the choice for you…..
Dolphin Bay Resort is located on the small island of Peleliu, 23 miles south of Koror (a stunning 45 minute boat ride). The resort offers seven newly built waterfront bungalows, warm and welcoming amid the natural island greenery. 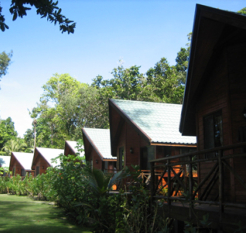 Bungalows feature either a queen or two twin beds, ceiling fan, a/c, private bathroom, mini-bar, and private balcony. Extremely basic, dormitory-style accommodations on an absolutely stunning private island….that’s the bottom line. If world class diving and a clean bed is what you’re looking for…..then you’ve found it. 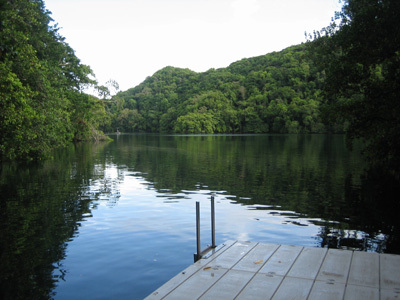 Carp Island Resort is an hour boat ride from Koror and just a ten minute boat ride from Blue Corner. There are daily boat transfers from the resort to Koror. 6 Seaside Cottages with sliding glass doors are located just steps from the beach and offer 2 double beds and a table fan. There is no air-conditioning available on the island. 2 Deluxe Seaside Cottages offer a bit more space, an additional bed for triple occupancy, more windows and a little more ambiance (below). 5 Sunrise Cottages (left) are similar in layout to the basic Seaside Cottages, but with 2 nicely sized windows rather than one small window. The 2 sunrise suites each feature front, ocean-facing verandas and back, garden-view balconies. A similar layout to the other cottages features 2 double beds with a slightly more spacious bathroom. The dive house offers ten spartan rooms. Seven of these offer 2 single beds while the other three feature bunkbeds for group divers. Two communal toilet and shower rooms are adjacent to the building. Breakfast & dinner are served buffet style, while lunch is served in a set menu. Fresh fish, sashimi, fruits, and organic vegetables are frequently featured while a barbecue dinner can be enjoyed every Sunday night. 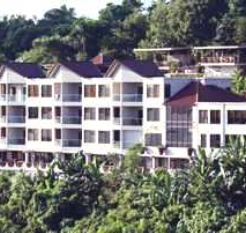 Cliffside Hotel is situated on a hillside overlooking Koror and its bays. 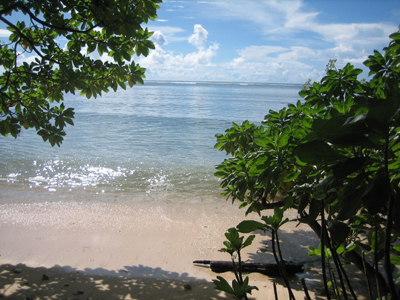 Although it is only five minutes from all dive shops, the quiet location offers a sense of convenient seclusion. The Standard Deluxe rooms are equipped with either one or two queen size beds, a/c, telephone, cable TV, DVD player, refrigerator with minibar and bath amenities. Some have balconies and all have great views. Also available are the Presidential Suite (with both a king and a queen size bed, a full size kitchen & bar area and a private hot tub), the Executive Suite (similar to the Presidential Suite, but with two queens and no hot tub) and the Cabana rooms (with private hot tubs and outdoor patios). West Plaza Hotels provides 134 comfortable and affordable rooms at 5 separate hotel locations throughout Koror. All 5 hotels feature air-conditioned rooms, private bath, tub & shower, full bath amenities, phone & fax services, cable TV, refrigerator, complimentary coffee, laundry & dry cleaning services, airport transfers and complimentary beach towels. West Plaza DOWNTOWN, located in the heart of Koror, offers 20 Standard and Deluxe rooms and provides easy access to the shopping district and “restaurant row”. West Plaza By the Sea offers 36 rooms ranging from Standard and Deluxe rooms with kitchenettes to a roof deck Penthouse suite. The Red Rooster Cafe and Toyota Rent a Car are located on site. West Plaza Malakal features 34 rooms near the main dive shop & tour departure point in Koror. Choose from a Standard room with private balcony or a two bedroom Suite with full size kitchen, dining area, living room and bayview window. Located across from the hotel is Palm Bay Bistro, home of the locally brewed Red Rooster draft beer. The restaurant boasts Pacific Rim and Asian cuisine and tables with very nice views. Located at Sam’s Tours, this is the perfect spot to take in the sunset after a day of incredible diving. Fresh fish, burgers, sandwiches, and locally brewed beer. Open 7:30am to 9:00pm. This is quite possibly the best restaurant in Palau. Choose from a wide range of excellent Indian dishes. Try the butter chicken or a vegetarian sampler plate! 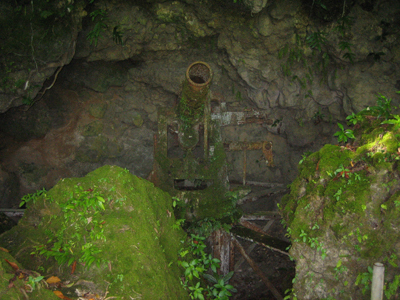 Located in Koror. For western and international cuisine, fresh fish, and fresh salads, head to Kramer’s Cafe in Malakal. Also a bar and hang out for local expats, it’s a great spot to relax, enjoy the sunset, and maybe throw a few darts. Rene and Jane are the owners and will make you feel right at home. Tasty Japanese food with a pacific twist. 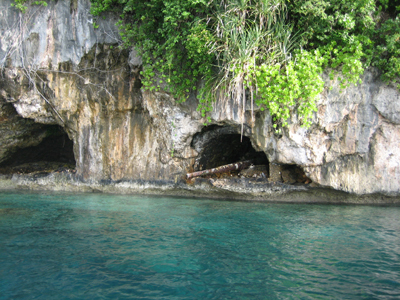 Located in Koror. Local and Asian cuisine….fresh coffee & pastries in the morning. 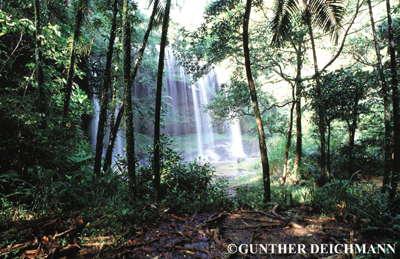 Located in Koror. Your typical American diner. They serve good pizza and burgers, and American breakfast. Korean BBQ. Located in Koror. 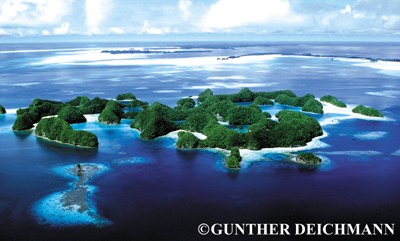 Palau is North of Indonesia, East of the Philippines, South of Japan and West of Guam. Los Angeles to Honolulu is about 5 hours, Honolulu to Guam is about 7 1/2 hours, and Guam to Palau is about 2 hours. They use the US Dollar. Credit cards are accepted by most companies, but not all. English & Palauan are the official languages. 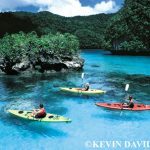 Please visit www.travel.state.gov and choose “International Travel” and “Palau” to get the latest information. U.S. citizens need a passport that is valid for 6 months PAST the date of arrival. Currently, you are allowed 2 checked bags of 50 lbs each and 1 carry on of 40 lbs. The carry on is more of a size-related issue rather than weight. Continental Airlines has full jet service the entire way. The longer flights are on 767’s. The shorter flights are on 737’s. The 767’s have a 2-3-2 configuration. The seats are A-B space D-E-F space K-L. For couples, we always try to assign A-B or K-L. The 737’s have a 3-3 configuration and the seats are A-B-C space D-E-F. For couples we usually assign A-B or E-F as a higher percentage of people prefer window seats. We can always change seats per your request. Yes, we always arrange for transfers to and from the airport. Your name and flight information will be given to a transfer company and they will be looking for you. It’s a small airport. 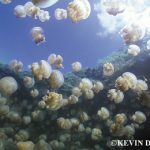 Warm water, 100′ vis, walls, corals, reefs, wrecks, pelagics, tropicals, critters. 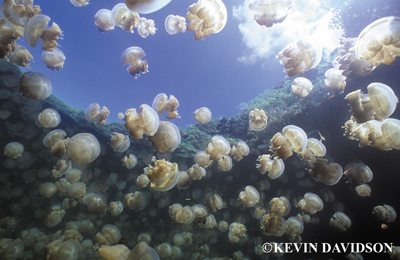 Palau has it all. The water will be in the low 80’s. We recommend a full 3 ml. You may be diving several times a day for extended periods. Typical land based boat rides are an hour and sometimes a little more. 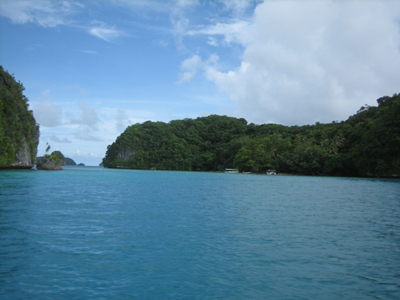 It’s a beautiful boat ride through the Rock Islands, and the water is 3 shades of blue. Typically you’ll be picked up at your hotel between 8 and 8:30 am. 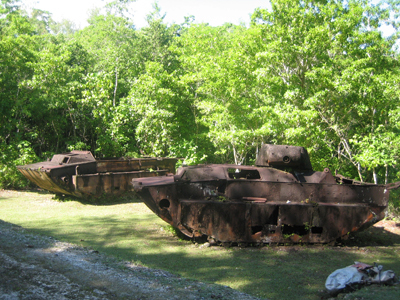 You’ll dive one tank, have lunch on a beach, dive another tank and be back at the dock by late afternoon (3-4 pm). Departure tax ($20), green fee ($15), dive permits (Koror with no access to Jellyfish Lake: $50, Koror with access to Jellyfish Lake: $100, Peleliu: $25 for 14 days or $10 for 1 day), fuel surcharge for trips to Peleliu, dive rental equipment, dive insurance, travel insurance.